NIST Special Database 32 - Multiple Encounter Dataset (MEDS-II). All full-profile face images from the dataset were removed because they are not supported by VeriLook SDK. This resulted in 1,216 images of 518 persons. University of Massachusetts Labeled Faces in the Wild (LFW). According to the original protocol, only 6,000 pairs (3,000 genuine and 3,000 impostor) should be used to report the results. But recent algorithms are "very close to the maximum achievable by a perfect classifier" [source]. Instead, as Neurotechnology algorithms were not trained on any image from this dataset, verification results on matching each pair of all 13,233 face images of 5,729 persons were chosen to be reported. All identity mistakes, which had been mentioned on the LFW website, were fixed. Also, several not mentioned issues were fixed. Some images from the LFW dataset contained multiple faces. The correct faces for assigned identities were chosen manually to solve these ambiguities. Both datasets contained faces, which are impossible to detect with the fastest near-frontal face detection. Face detection parameters were tuned to fully automatically detect maximum amount of faces with highest recall ratio using ±45° detectors, no speed optimizations, smaller search step and other parameters. Experiment 1 maximized matching accuracy. 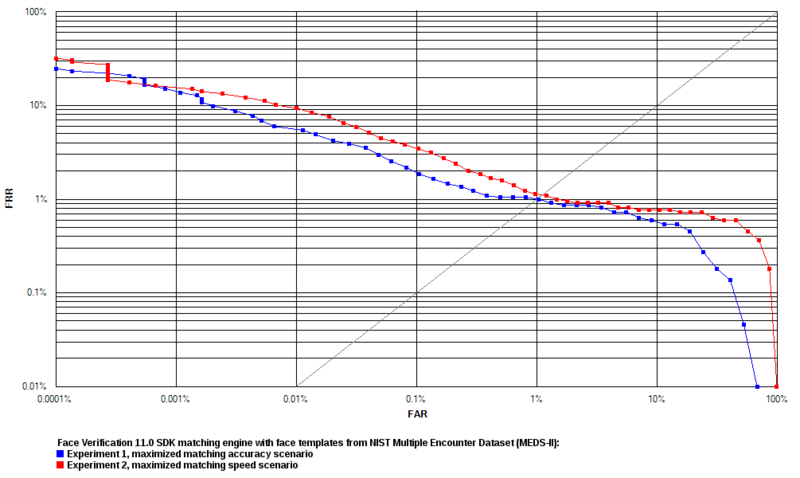 Face Verification 11.0 SDK algorithm reliability in this test is shown on the ROC charts as blue curves. Experiment 2 maximized matching speed. Face Verification 11.0 SDK algorithm reliability in this test is shown on the ROC charts as red curves. Receiver operation characteristic (ROC) curves are usually used to demonstrate the recognition quality of an algorithm. ROC curves show the dependence of false rejection rate (FRR) on the false acceptance rate (FAR). Equal error rate (EER) is the rate at which both FAR and FRR are equal.